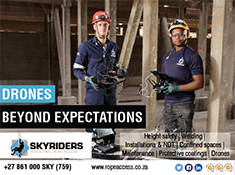 Skyriders recently enlisted the Elios drone for a roof-replacement project for a major industrial client, which was conducted in conjunction with Rope access aided ultrasonic (UT) wall-thickness testing – a method of performing non-destructive measurement on a solid material such as a steel wall, based on the time taken by ultrasound waves to reflect off the back surface and return to the probe. This measurement is determined by an ultrasonic thickness gauge. According to Mike Zinn, marketing manager, Skyriders, the industrial client had to make a major capital-expenditure decision due to the need to replace the roof of a large storage tank. If it could be determined that the underlying support structure had sufficient integrity to support the new roof, the client would save millions on the project. Zinn adds that if an entirely new support structure was required, the roof-replacement project itself would be delayed, as the structure would have to go out to tender to be designed, fabricated and installed. “One of the biggest parts of our job is visual inspection of structures, silos in confined spaces, pipes and smokes stacks and general support structures. “One of our clients, a petrochemical plant in Gauteng , wanted to replace the roof sheeting on a big petrochemical storage tank, but was concerned about the condition of the actual structure and did not want to put new roof sheeting onto a structurally weak roof. The client wanted to inspect it first. “This is where the expertise and technology of Skyriders was called upon. While the client has previously used Skyriders Elios Sky Eye technology for inspection purposes, this was the first time the system was used in conjunction with rope access aided UT wall-thickness inspection,” says Zinn. He explains that the Skyriders’ team was able to access the storage tank once it had received the necessary permit in this regard. The drone was used to conduct a thorough visual inspection of the internal support structure to see if it was safe – that there was no bending or buckling. Thereafter, technicians used rope access to reach the 14 m high roof, and carried out UT wall-thickness measurement on select steel members. “The information was then compiled into a detailed report, with the assistance of specialist engineering company Nyeleti Consulting, and presented to the client. Within two days we were able to produce a verified report assuring the client that the existing support structure was indeed adequate for the new roof covering,” Zinn confirms. Based on that information, the client decided the old roof sheeting only would come off and be replaced with new. This was a R5-million decision including replacing the structure, without taking into account lost time, project overruns and resources. The Skyriders Elios Sky Eye drone is the world’s first collision-tolerant drone that can access controlled and confined spaces without risk of crashing. It also avoids expensive time-consuming access methods such as scaffolding, says Zinn. The drone then gathers close up images for high resolution data with a sub millimetre resolution onboard lED lighting system and a complete remote control of the camera settings that allows navigation and inspection, even in pitch dark environments. “For a waterproofing analysis of a flat roof structure, for example, we’ll fly the drone in the late afternoon after the rains, and try and pick up the warm water that’s sitting underneath the waterproofing. 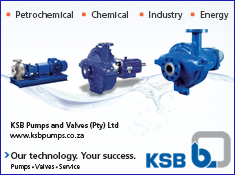 This is mainly for construction and civils industries. The drone also features an HD camera and a thermal camera imbedded on the drone. “We intend using the thermal imaging aspect on concrete structures. One of the ways of looking for areas of potential spalling is by conducting a hammer test. So, the rope access guys will abseil down and tap on the structures looking for hollow sounds. Zinn notes that in the 20 years of being in business, the company has never had any fatalities with the work it does. He adds that working with drones further ensures that at inspection stage, no injuries or fatalities take place. “The drones are really keeping us up to date with new technology and helping us to go into dangerous places. However, in most of the places we work, human beings will eventually have to go in to do the repairs, so we use the drones to inspect if it’s actually safe to do so. Zinn explains that the big problem for the company was that previously, its old way of doing things was to look through a ‘door’, then assume it was okay to enter. Technicians would then enter from the bottom, and build scaffolding. The problem with this, he says, is if there are dangers hanging above and they fall onto people, the chances of injuries are extremely high. And that has happened, he explains. One of the workers was hit with a large piece of clinker build-up that fell off. “Our job therefore is to go into a maintenance or repair project, identify hazards such as clinker and, using rope access coming in from the top, remove them to make the environment safe for people entering from below. Zinn explains that the strategy for Skyriders going forward is to increase market awareness of this unique value-added service offering and to communicate to clients the full potential and diverse applications of drone technology. “When we started out with Elios collision-resistant technology, it was perceived as being quite progressive and advanced. Now it has almost become a standard operating procedure. What is readily apparent is that this has become a key element of all the work we do,” he concludes.